Hi there! 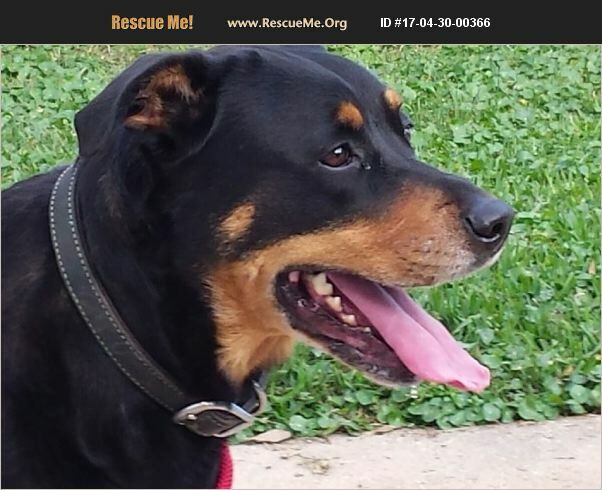 My name is Jerri, and I am a sweet, fun-loving 78-pound female purebred Rottweiler (no papers) who was born in January 2010. I'm 'beautiful, healthy, strong, and still very active,' says my human. I have lived most of my life indoors, so I am a great TV/ sofa companion. Although I am not crate-trained, I'm thoroughly housebroken and not destructive when my human is not home. I do enjoy the outdoors where I can play with my soccer ball and toys or just run around. Although I have never been around cats or small children, I love dogs; I adore treats even more but don't like to share them! (Now who could blame me?) My Good Samaritan rescuer found me on the street in June 2010 as an abandoned, stray 6-month-old puppy with gauze around my paws and stitches from being spayed. It's been a wonderful life with my rescuer up until now. Unfortunately my beloved human has developed some debilitating health issues and can no longer physically care for me. Regretfully, she is trying to find me a wonderful new lifetime family to cherish me as much as she has. Could yours be that family? Jerri is updated on shots, spayed, dewormed, microchipped, and heartworm tested. Her adoption fee is $150, check or cash payable to Buster's Friends. Please click the contact button if you are interested in Jerri, and we can arrange for you to meet her. To make the process more efficient, download the adoption application at http://www.bustersfriends.org/dogadoptionapplication.shtml. First save and then open it; then you can print it and fill it out.